If the cover of this week's issue of Entertainment Weekly is any indication, we're in for a wild final season for How I Met Your Mother, or the characters are anyway. 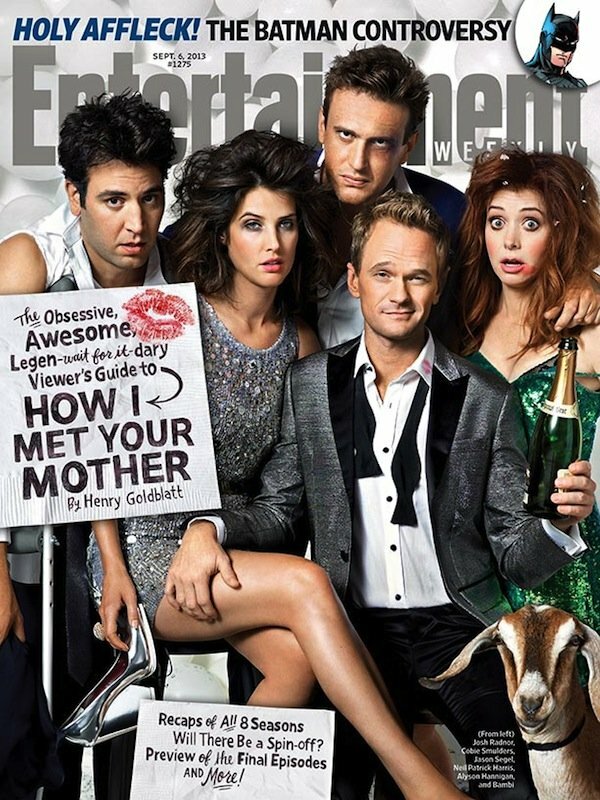 As they say somewhat regularly on the CBS comedy, it's gonna be legen - wait for it… The cover of the magazine shows us series stars Josh Radnor (Ted), Cobie Smulders (Robin), Neil Patrick Harris (Barney), Jason Segel (Marshall) and Alyson Hannigan (Lily). Who's missing? The same character that's been missing all series up until the final moments of Season 8, and that's the mother. Season 9 is expected to cover Robin and Barney's wedding, which is likely where EW's cover comes in, as everyone looks thoroughly partied out. The Season 8 finale gave us our first look at Cristin Milioti, the beautiful actress who's signed on to play Ted's future wife and mother of his children. While she isn't featured looking wrecked on the cover of EW, the site did share this adorable couples shot of Ted and "Mother" together. This may be sheer optimism here, but they really look like a nice couple. In the interview with Milioti, the Tony-nominated actress admits she hadn't actually watched the show prior to being cast. In fact, her casting was as mysterious to her as the mother has been to viewers for years. I received a phone call from my agents, and they said, “How I Met Your Mother would like to interview you for a possible character arc,” and I asked, “What’s the character?” And they said, “We don’t know.” So I had a Skype meeting with [creators] Craig [Thomas] and Carter [Bays], and we talked maybe for a half hour. I told them about Once, and a few days later they sent people to the show. Then I was told that I was going to fly to L.A. to test for this role, but I still had no idea what it was. They were so secretive, so I had my suspicions. As for what we have to look forward to about the Mother, Milioti says, "She has a unique sense of humor that is very similar to Ted’s. She’s a young woman who suffers from dad humor…that’s how she rolls. Someone who says a joke and you’re immediately like, “Daaaadd!” Corny isn’t even the word — a little nerdy." Love it! I'll admit, I've had a hard time appreciating most of the girls Ted has dated throughout the series, including Robin, whom I adore as a character, but not for Ted. I'm really hopeful that Milioti's character will really click with Ted. As important as it is that we know how Ted "met" his children's other, I think it's as crucial that she and Ted click. It's all building up to this! How I Met Your Mother returns for Season 9 on Monday, September 23 on CBS.